Danish First Division club Vejle Boldklub have confirmed that they have signed a contract with Peter Utaka following a successful trial. The four-month deal penned by the Nigeria international striker will see him remain at Vejle Boldklub until the summer of 2018. In his first words as a player of Vejle, Utaka said : ''I know Vejle has a very talented team and there is great quality in the squad. I have seen this by myself during the last week's training. ''The club's owners know me and therefore I also know that the club's ambition level is high. Both for the coming half season and for the future in general. 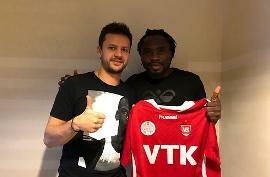 The 34-year-old Peter Utaka previously turned out for clubs in Belgium, Denmark, China, Japan and Croatia.